We're staying in Nova Scotia this weekend with today's custom team. The Halifax Raiders are a joint effort by Justin Cox and Mat Ware. 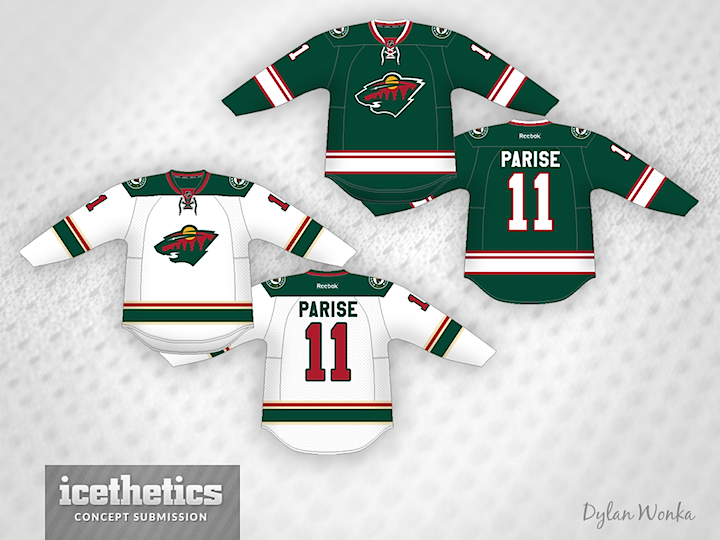 Mat sent along these excellent designs, the quality of which would easily fit into the IceHL Project. Justin and Mat went all out creating this identity. 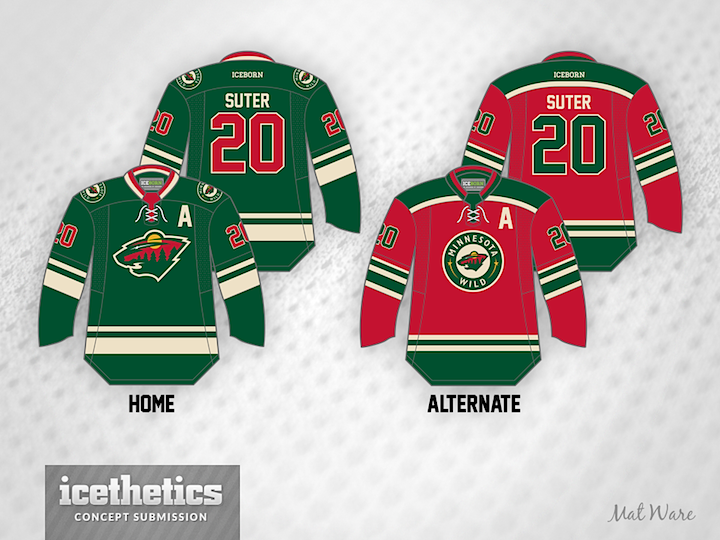 They created five logos and four jerseys — including alternate and Stadium Series designs. Last week we introduced the College Saturday series. We pick it up today with the University of Lethbridge in Alberta. Mat Ware came up with this look for the Pronghorns. He also provided a few photos to show us what the team's current uniforms look like. The Olympics are long over, but the International Sunday series continues. Today, Mat Ware presents a bit of a throwback as we contemplate the South Korea Games in 2018. 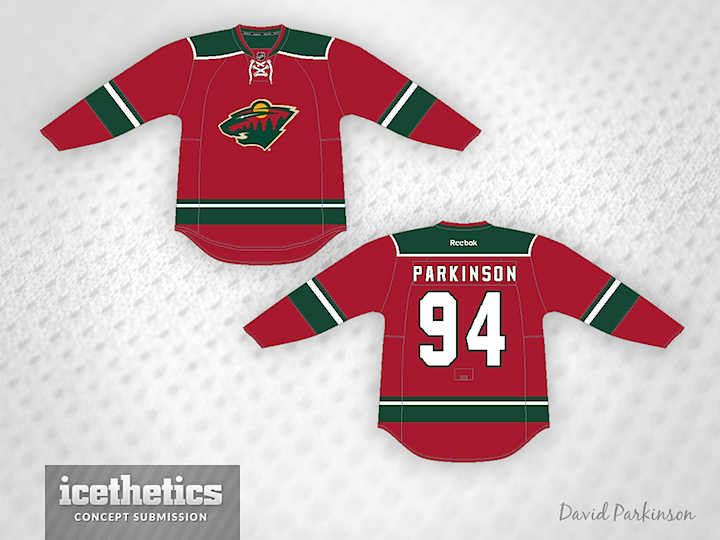 So often the Minnesota Wild are given a hard time for their "Christmas colors." And whether you agree or not, today one is the perfect opportunity to celebrate that. 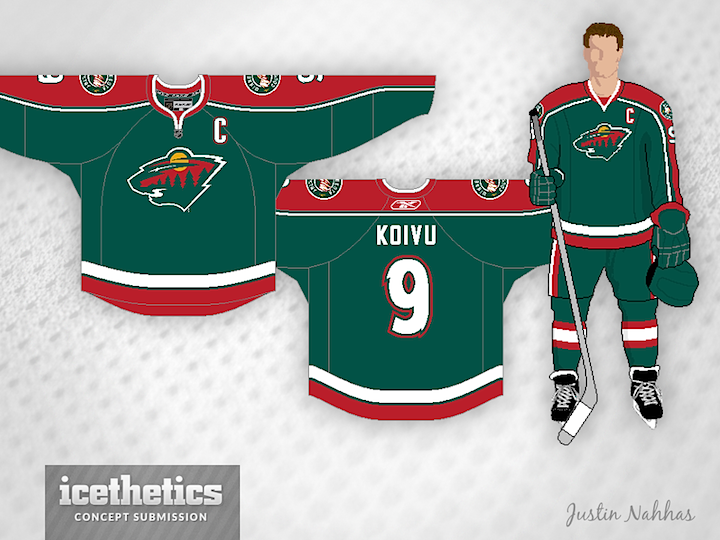 First up is Mat Ware whose created home and alternate jerseys to go with the team's new road sweater. Next is a sweater by David Parkinson who put together just the right combination of red and green for that holiday feel. On the other hand, Justin Nahhas went with a green jersey and still achieved a similar effect. Finally, Dylan Wonka presents a pair of jerseys. The white one is pretty solid, but the Wild but the green one has some very merry striping if you ask me. Before you go, I've got a bonus concept that was tailor-made for today. 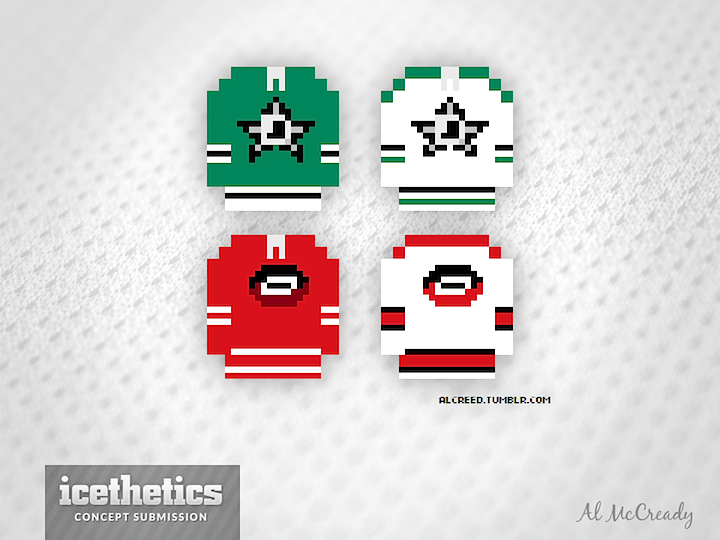 Our favorite 8-bit artist Al McCready recreated the Stars' and Hurricanes' new uniforms in his unique style. Merry Christmas! 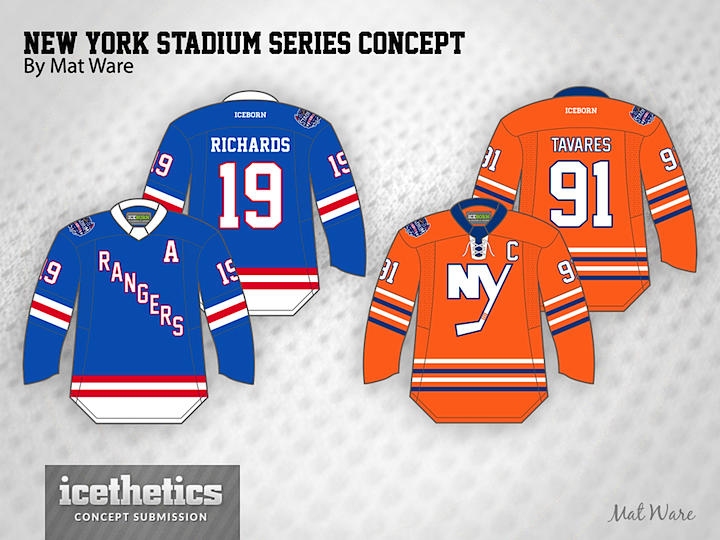 Stadium Series Week is winding down with another day of New York-centric concepts. 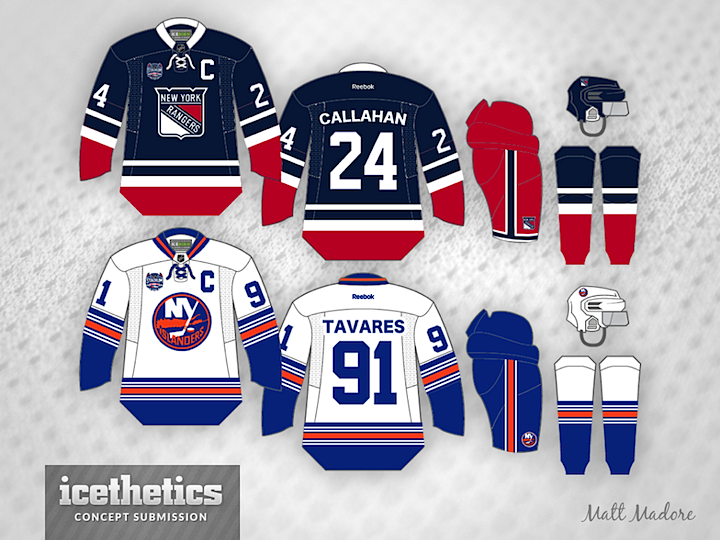 Matt Madore presents this set for the Rangers/Islanders meeting. It's so unusual to see that shield on a Rangers jersey, but it really works. As for the Islanders, that's a lot of stripes. And the prolific Mat Ware imagines a more colorful assembly of these two teams. Orange is becoming a very popular base for jersey concepts these days. Think we need more orange jerseys around?